This morning (Saturday 23 August) the Weekend Australian published articles by Graham Lloyd, their Environment Editor, on homogenisation practices at the Bureau of Meteorology as questioned by Jennifer Marohasy. As I had a small part to play in bringing this to public light, here is a brief post to bring readers up to date. The article referred mainly to adjustments at Amberley and Rutherglen. 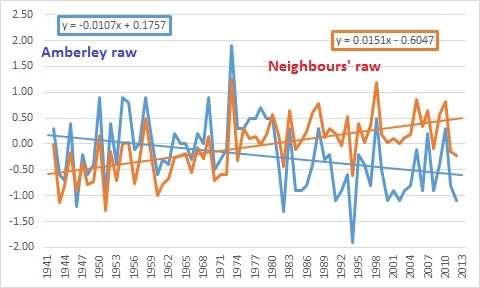 According to the BOM, the major adjustment was due to a pronounced discontinuity around 1980, that is, Amberley’s drop in temperature is not reflected in those of neighbouring sites, as is evidently correct. 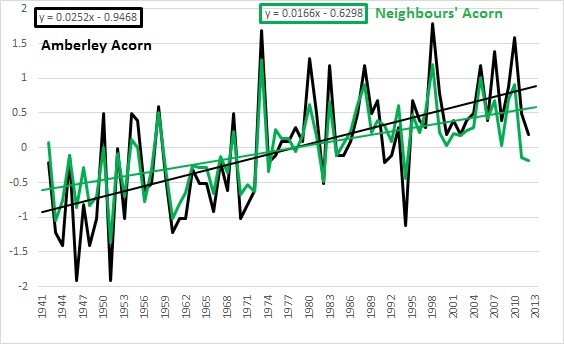 However, the nearest Acorn site only 50km away, Brisbane Aero, also has a pronounced cooling trend, and a local cooling cannot be discounted. 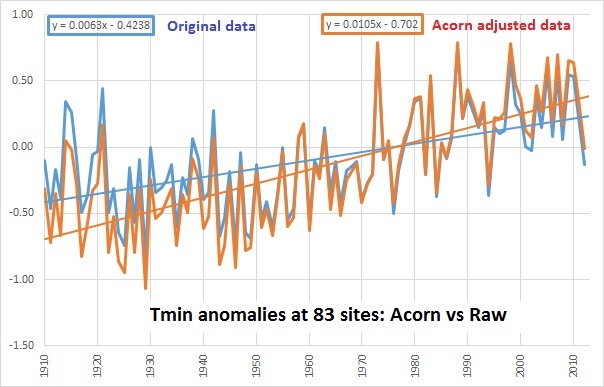 An adjustment to the raw data before 1980 may be warranted, however, the size of the adjustment is questionable to say the least. 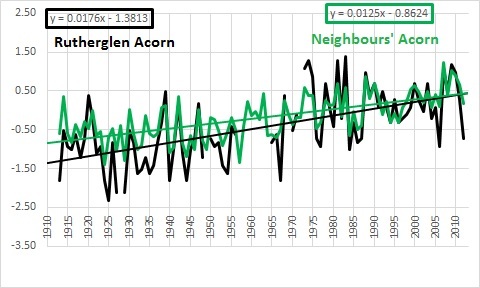 The resulting trend at Amberley has now become greater than the trend of adjusted data at every one of the Acorn neighbours, and more than +0.86C greater than their mean. 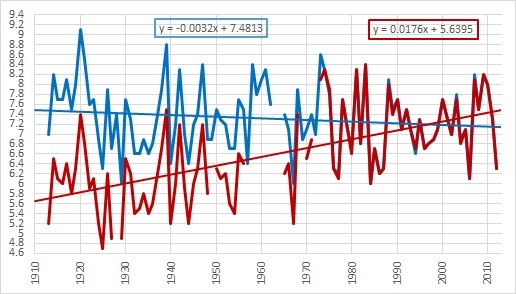 Rutherglen in Victoria again shows cooling turned into warming. The BOM is defending its territory, but this latest media exposure will mean increasing and critical scrutiny. Click for further examples and background. Jennifer Marohasy has written to Dr David Jones, head of climate monitoring and predictions at the Bureau of Meteorology, which she has posted as an Open Letter at her blog. She asked me to review her draft and I made a few small suggestions. I wish her good luck with Dr Jones. I am persona non grata with him apparently and I had to write to the Minister before getting a very unsatisfactory reply, many months later, from BOM- Jones refused to reply. I had to follow up with the Minister again, with a copy to Greg Hunt as Opposition spokesman, before getting some requested information, and an apology. I analysed this information here. Promised Journal articles did not arrive at all, and after writing again to the Minister, I received a completely irrelevant paper on ACORN-SAT. Another letter brought another reply from the next Minister, but still no substantive information I had requested. This was in August 2012. My first request for a response from Dr Jones was in July 2010, and my first letter to the Director of Meteorology was in October 2010. I gave up after this. I hope Dr Marohasy has more success than I did. Posted by jennifer, January 9th, 2014 – under Information. 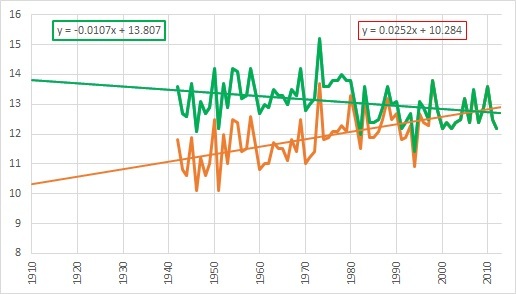 Still No Evidence of Greenhouse Warming! a comment from “Luke” (who else) objecting to my use of 2nd order polynomials in yesterday’s post. Strictly I should stick to linear trends for a 35 year timescale, and use polynomials only for much longer periods. Therefore, here is a plot of Australian annual minima and maxima for the 104 years from 1910 to 2013, using data straight from the BOM. Note how the blue (minima ) curve also gradually rises over the years and apparently continues to do so. However I have circled the graphs in the 1980s and the last few years. I have blown this up so you can see more clearly what is happening. Since the mid 1980s there is a divergence in trends. Daytime temperatures are rising faster than night time temperatures. This is a problem because increasing CO2 and other greenhouse gases should be slowing back radiation, which should be evident in night time temperatures increasing faster.